Websites online are competing with each other to achieve their eventual goals, like lead generation, increased sales volume, subscriptions, huge followers, and more. After content marketing, paid advertising, and SEO, still websites are not able to meet their goals. It’s true that websites receive traffic, but still, most of them are unable to meet their ultimate business goals. Why? It happens because websites are not able to convert their online traffic to potential and loyal customers. But it is extremely important to convert customers and earn revenue. For this, you have to think about metrics other than SEO and paid advertising. What might be appealing to one individual can be a turn-off for other visitors. Even an expert cannot conclude to one thing that can be visually appealing to each and every person. In this case, the best step is to go in sync with the majority and select visuals and content that is preferred by most of the incoming traffic. A site is made of numerous elements, including buttons, texts, videos, images, and textual content. There are different ways of presenting each of these contents. You can think about countless combinations in order to visually present each one of the content. With multivariate testing, it is possible to identify the best and most effective combination of each element in order to meet the ultimate goal of your website. For example, if your website has an element (A), which can vary (X) numbers of times in combination with another element (B), which can vary (Y) numbers of times, then you have to test all possible combinations of both the elements. In this case, you have to multiply the variations of A(X) to B(Y) in order to get the total number of combinations to be tested. The combination can be between an image and text, a text and video, an image and video, and more. Hence, you need to test the best combinations in order to get the best combination. The combination that drives the highest conversions will be your ideal choice. Does this make multivariate testing similar to A/B testing? Wait! You are making a mistake! Multivariate testing and A/B testing are two different things. Read the next section to know how the two differ from each other. Let’s discuss the two aspects one by one. A/B Testing – What does it mean? Also called split testing, A/B testing is a process of optimizing a website in which the conversion rates of two versions of a webpage are compared to each other. The comparison is made using live traffic. The website visitors move either in one version or the latter one. To identify the best version and analyze the behavior of the visitor’s interaction, different elements are tested. The buttons visitors click, the page they are shown, videos watched by them, whether they sign up for a newsletter or not, and more. This way, the most effective page is determined. When A/B Testing is used? A/B testing is a simple testing process and hence, most of the marketers prefer using this method. Design experts use A/B testing to determine the most effective design for a webpage. The two designs may vary for different elements, but A/B testing gives you the results for an entire page and not for specific elements. In addition to this, A/B testing is used as an optimization technique for pages where only a single element is available for debate. The A/B testing process used this way often includes more than two elements. The method is simple in design and concept. It is a powerful tool that can be used widely for numerous components. This method does not rely on heavy traffic and hence it delivers reliable data. It is an excellent technique for websites with small numbers of daily visitors. The process is fast and convenient to interpret. It is therefore used as a primary mode of testing. It is an excellent way to introduce the concept of optimization as it can swiftly illustrate the quantifiable impact of even a simple change in the design. Undoubtedly, A/B testing is a versatile method that can be used to perform iterative cycles of redesign and testing to make great enhancements to your website. But, it comes with certain limitations, which needs to be summed up. A/B testing is excellent to measure the impact of two or four variables and not more than this. Tests involving more number of variables may take longer to run and deliver results. To test different elements of a web page, multivariate testing is an optimal choice! This form of testing utilizes have core functionality similar to A/B testing. But it is great to compare multiple variables at once. The best thing is that this testing process can be used to determine how multiple variables interact with each other. The main purpose of this kind of test is to determine the efficacy of various design combinations in context to the website’s ultimate goal. Multivariate testing can be used for websites already receiving some amount of traffic. This test can compare each variation of a design to give you the most successful design and to identify elements that have the biggest negative or positive impact on the interaction of a visitor. When Multivariate Testing is used? The most common use of multivariate testing is for webpages with multiple debatable elements. For example, a webpage including a sign-up form, a footer, a catchy header text, and more. In order to perform the multivariate test, you don’t have to create new pages for comparison. Rather, you just have to create multiple variations of elements within a page, like a header, text, images, footer notes, and more. It is a full-factorial testing process and is ideal for websites receiving a high volume of traffic on a daily basis. You can identify the comparison of each element on the webpage to identify conversion on each page. Like, what elements are more performing and what not! It is a powerful tool that can help you target redesign efforts to various elements of your webpage and where they will have most of the impact. It is particularly useful when designing campaigns related to the landing page. You can know about the impact of design elements that can be applied to future campaigns, even when the context of the element has altered. One prominent limitation of this process is that it requires a huge volume of traffic for execution and completion. Additionally, it is a completely factorial process and changing multiple elements at once can result in numerous possible combinations, which must be tested. In this case, even a site with high traffic can complete one test with more number of combinations in the desired time. Moreover, you have to decide a timeframe to perform multivariate testing to ensure how it will fit into your business cycle. 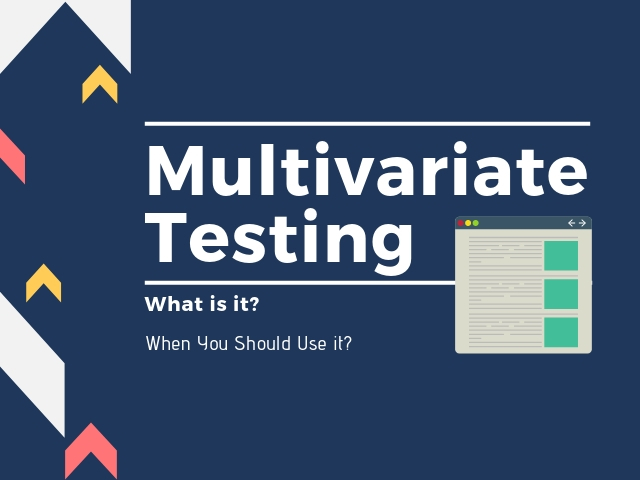 Multivariate testing is a quite lengthy process. But the good thing is there are certain tools available that you can use to perform multivariate testing in the shortest time. These tools are designed to assist you in conducting full-factorial multivariate testing. Hence, they can serve you with different combinations of your multiple site elements. Here check the best tools for multivariate testing. AB Tasty is a wonderful tool available for free trial. The paid version of this tool is available for $34. This tool is great in terms of goal setting, cost, email testing, traffic segmentation, email testing, web page creation, as well as customer support. The next best tool in our list is Convert. This tool works great on all aspects of testing except the two. The free version of Convert is available for a period of 15 days. You can, later on, use the paid version for a price of $599 per month. If in case you wish access to more features then you can buy the Pro plan that is available at a price of $799 for one month. Accenture is another incredible tool introduced from a software and business giant organization, Accenture. It is an excellent tool for choice-modeling functionality, which is of great help for multifactorial testing. But even this tool has the disadvantage of unable to create web pages. Its initial cost is $33,000, which can increase to $320,000 based on the ongoing costs. Optimizely is the next tool incorporated with multiple rich features. The best thing is that it comes with a fixed monthly fee. Hence, you don’t have to worry about an increase in cost. Since it does not come with complete technical support or web page creation feature, so you may not find it much beneficial as compared to other similar tools. Last, we have a really good tool in our list. Conductrics is proved to be good on all aspects except one or two. First, it does not come with great technical support and secondly, there is no platform available to generate new pages. It is first essential to know the basic steps to Multivariate Testing. Once you are aware of them, it now turns to follow some tips to ensure you boost your conversions with this incredible technique. It is important that your website receives a decent volume of traffic on your site. It is because the multivariate testing process can deliver the best results for websites already receiving some volume of traffic. It is always wise to perform multivariate testing for small changes in your website’s element like product images, call-to-action, and more. Avoid changing the complete design of your website at once. It is because this will not help you achieve significant insights on what works well best for your website and what does not. Multivariate testing can deliver adequate results only when you perform this technique on most vital pages of your site like product pages or landing pages. Further, you must select the correct elements of your site to test. Pick elements that can create a great impact on changing your site’s conversion rate. You can even use session videos and other similar platforms to identify such elements of your site. Use multivariate testing to identify the best layout for your website. The layout must have convincing content and must be simple in terms of navigation, images, color, videos, text, and other aspects of your site. Multivariate testing can help improve your site’s load time. It is because this technique can help to remove obstructions in the conversion and browsing process of your site. When you are performing multivariate testing, it becomes essential to keep track of every result that fails and succeeds. The same can be used for boosting conversions in further campaigns. Last but not the least, make sure you use advanced multivariate testing software that is easy to work with and that can reap results in the shortest time frame. You can assess the optimized value of your website only by testing it. Since every element of a site plays a key role in its success, so it is essential to include the best elements of your website. This can be achieved only through multivariate testing technique. As multivariate testing can deliver you real-time results showing what is most compelling and engaging to your audience. Use the power of multivariate testing and boost your conversions now!